Snowfall & Rainfall Summary - December 8, 2018. Blog Updated At 1:06 PM MST. Blog Updated At 6:19 PM MST. Blog Updated At Noon MST Sunday, Dec 9, 2018. Courtesy of Bonnie Farr Rogers. 3" Of Snow On The Ground This Morning. 2" On The Ground In NE Artesia This Morning. Courtesy Of Kathy Klein Wells. 3" On The Ground In West Roswell This Saturday Morning. (As Of 5 AM MST This Saturday Morning). 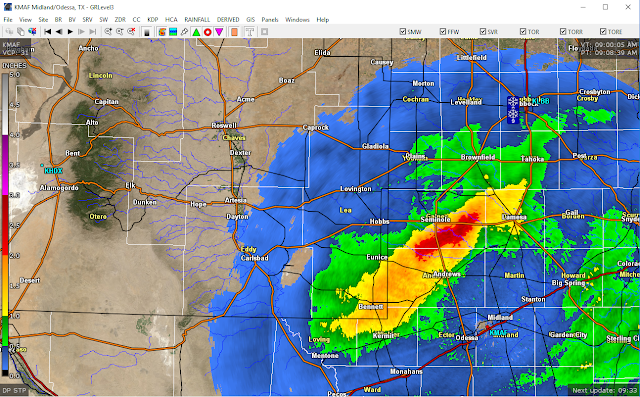 NWS Midland Dual Pol Doppler Radar Estimated Rainfall Totals. 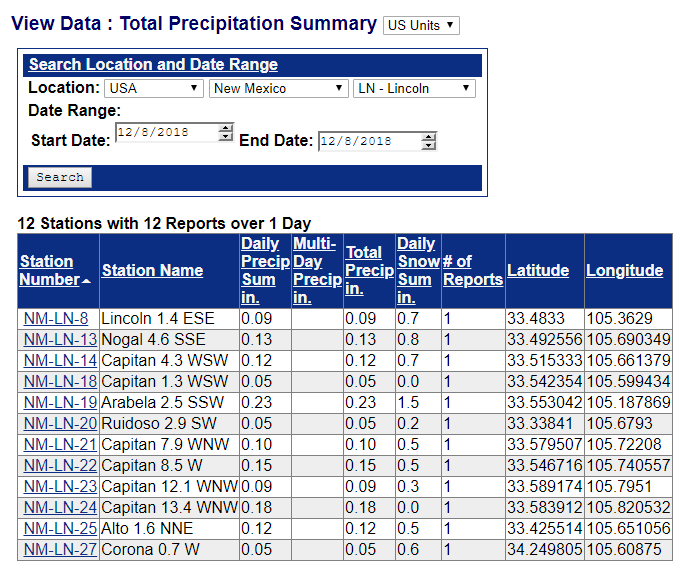 As Of 9:08 AM MST Saturday Morning. NWS 24-Hour Snowfall Analysis Map. 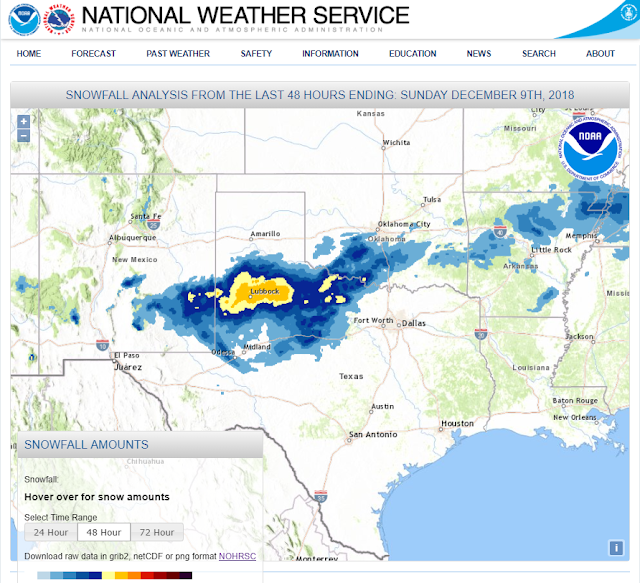 As Of 11 AM MST Saturday, December 8, 2018. NWS 48-Hour Snowfall Analysis Map. 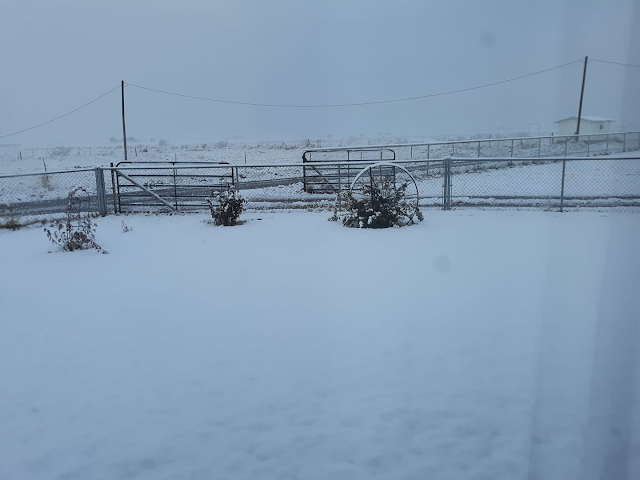 As Of Noon MST Sunday, December 9, 2018. The Lubbock National Weather Service Office measured a storm total of 10.5" of snowfall. 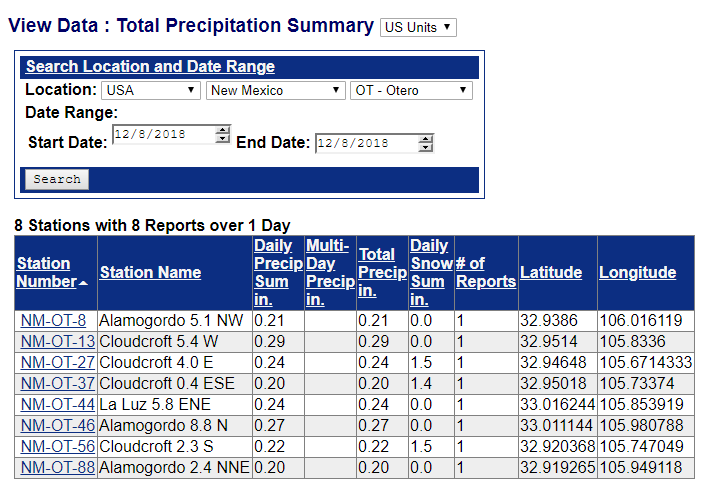 New Mexico CoCoRaHS 24-Hour Rainfall & Snowfall Totals. 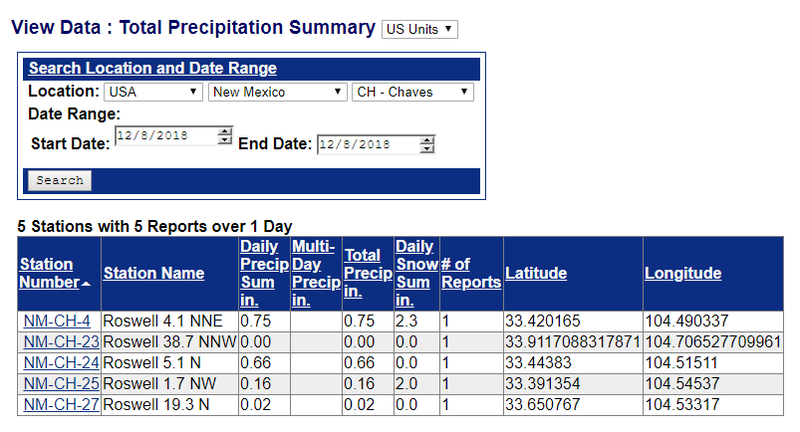 NWS Albuquerque Twitter Snowfall Totals. 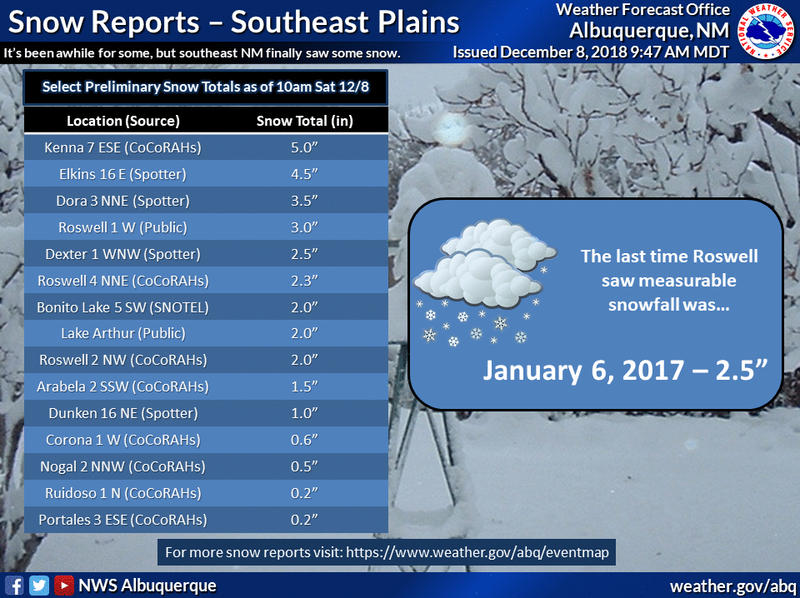 NWS Albuquerque Snowfall Total Reports. • 8 SSW RED RIVER - 5.0 in. • 7 ESE KENNA - 5.0 in. • 16 E ELKINS - 4.5 in. • 8 NE ARROYO SECO - 4.0 in. • 11 NNW CANON PLAZA - 4.0 in. • 6 WNW TERERRO - 4.0 in. • 5 NW CHAMA - 4.0 in. • 3 NW TRES RITOS - 4.0 in. • 3 NNE DORA - 3.5 in. • 1 W ROSWELL - 3.0 in. • 8 SSW SAN MIGUEL - 3.0 in. • 5 SSW TOADLENA - 3.0 in. • 7 ESE CHUPADERO - 3.0 in. • 6 W LOS ALAMOS - 3.0 in. • 1 WNW DEXTER - 2.5 in. • 4 NNE ROSWELL - 2.3 in. • 11 ENE RED RIVER - 2.0 in. • 7 SSE PEP - 2.0 in. • 9 E CUBA - 2.0 in. • 5 WNW LOS ALAMOS - 2.0 in. • 4 NW SANDIA PARK - 2.0 in. • null LAKE ARTHUR - 2.0 in. • 2 NW ROSWELL - 2.0 in. • null CHAMA - 2.0 in. • 5 SW BONITO LAKE - 2.0 in. • 3 E LOS ALAMOS - 1.5 in. • 1 WNW WHITE ROCK - 1.5 in. • 2 SSW ARABELA - 1.5 in. • 5 W POJOAQUE - 1.2 in. • 3 ESE ANGEL FIRE - 1.0 in. • 2 ENE GALLUP - 1.0 in. • 1 NW ROSWELL - 1.0 in. • 16 NE DUNKEN - 1.0 in. • 3 NE BONITO LAKE - 0.8 in. • 6 WNW ESPANOLA - 0.8 in. • 1 W CORONA - 0.6 in. • 2 E GLORIETA - 0.5 in. • 2 NNW NOGAL - 0.5 in. • 4 E ELK - 0.5 in. • 2 WSW NOGAL - 0.5 in. • 6 WNW NOGAL - 0.5 in. • 6 SSE SANTA FE - 0.4 in. • 1 NW VALDEZ - 0.4 in. • 2 W PONDEROSA - 0.4 in. • 2 SW AGUA FRIA - 0.4 in. • 1 N MILAN - 0.3 in. • 2 N MILAN - 0.3 in. • 1 W GRANTS - 0.3 in. • 2 WSW EL MORRO - 0.3 in. • 3 NNE LOS CERRILLOS - 0.3 in. • 7 N PILAR - 0.3 in. • 4 NNW LAMY - 0.3 in. • 5 ESE BLACK LAKE - 0.3 in. • 1 WSW SANTA FE - 0.2 in. • 4 SSW AGUA FRIA - 0.2 in. • 1 N RUIDOSO - 0.2 in. • 3 ESE PORTALES - 0.2 in. • 2 NNW EDGEWOOD - 0.2 in. • 2 SSW PECOS - 0.2 in. • null ANGEL FIRE - 0.1 in. 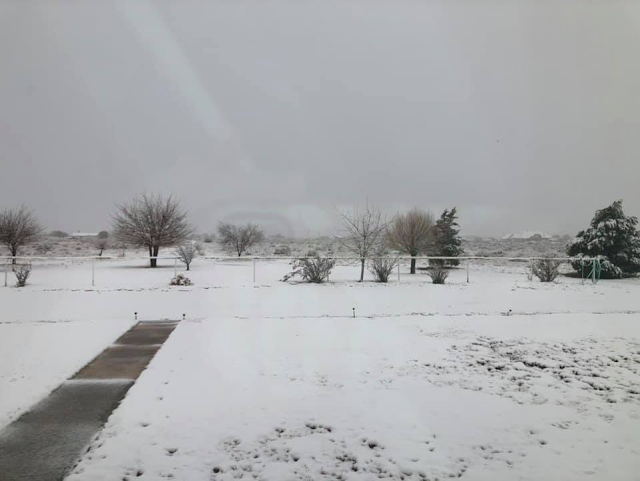 Lubbock Snowfall Last Night Into This Morning Breaks Records. (Courtesy Of Steve Divine - KCBD TV in Lubbock). 10.0” snowfall, replaces the record of 3.4” on this date in 1988. 0.90” precipitation (liquid content of all forms of precipitation, including snow), replaces the record of 0.45” on this date in 1982. 10.0” is the official snowFALL total at the Lubbock Airport - site of record for weather - making this the 3rd snowiest December on record, the 12th snowiest month on record, and the 41st snowiest season on record. Lubbock’s snow record began in 1911, though some data is missing for the first three seasons. The record is complete from Jan 1914 to present. 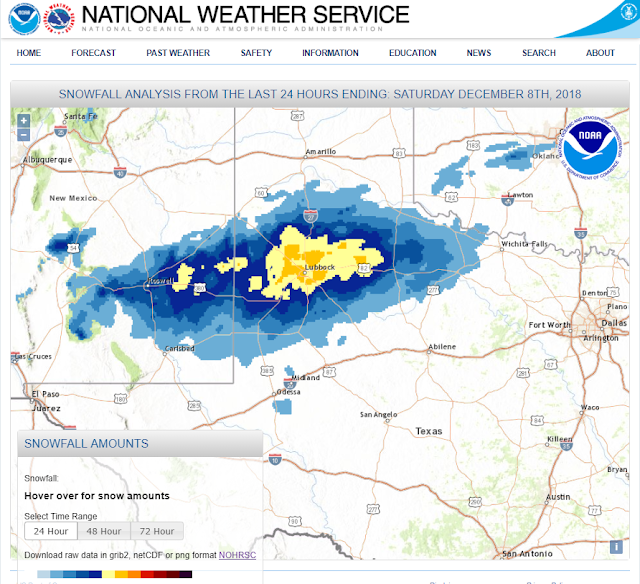 The NWS Lubbock office along the S Loop also measured 10" of snowfall. My preliminary review of the record indicates this is the second greatest snowfall, officially, for Lubbock in about 35 years, since the 25.3” in January 1983. 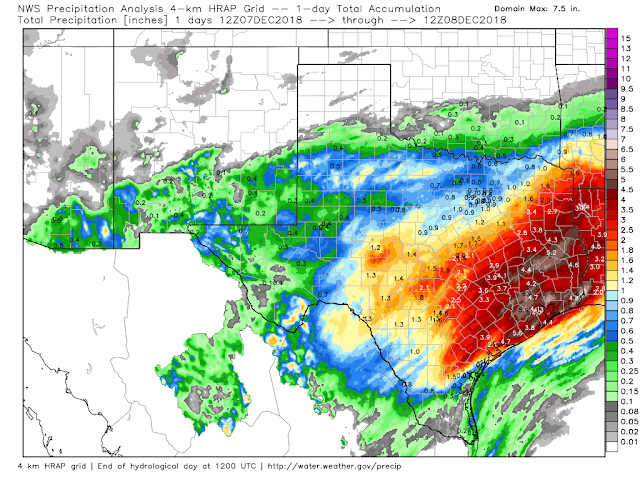 During the Blizzard of 2015, 11.2” fell on December 26-27. 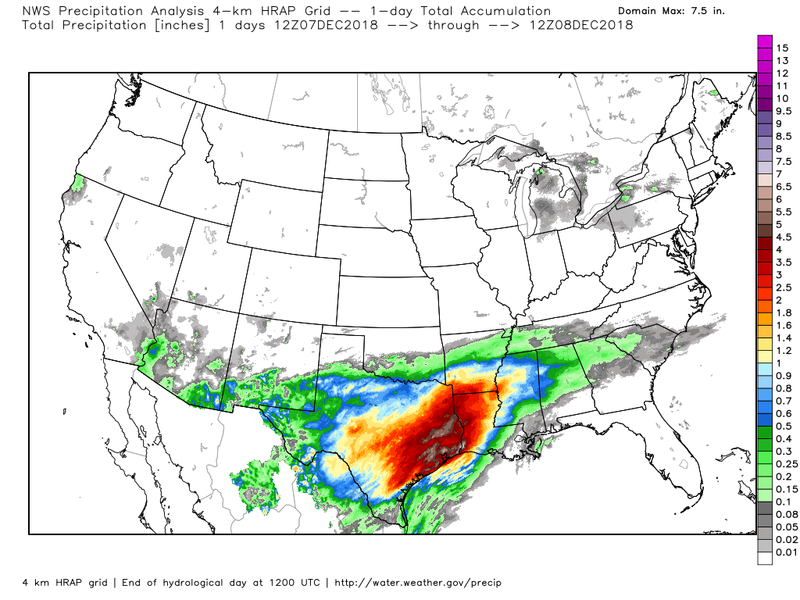 There are 40 seasons in Lubbock’s record with at least 10” of snowfall. There are 45 seasons in Lubbock's record with at least 9” of snowfall. I Was Right - This Winter Storm Had Some Surprises! One of those surprises was how little the snowfall totals we in the Sacramento Mountains. Its not often that you see more snow fall out on the plains than in the mountains but this was one of those cases. 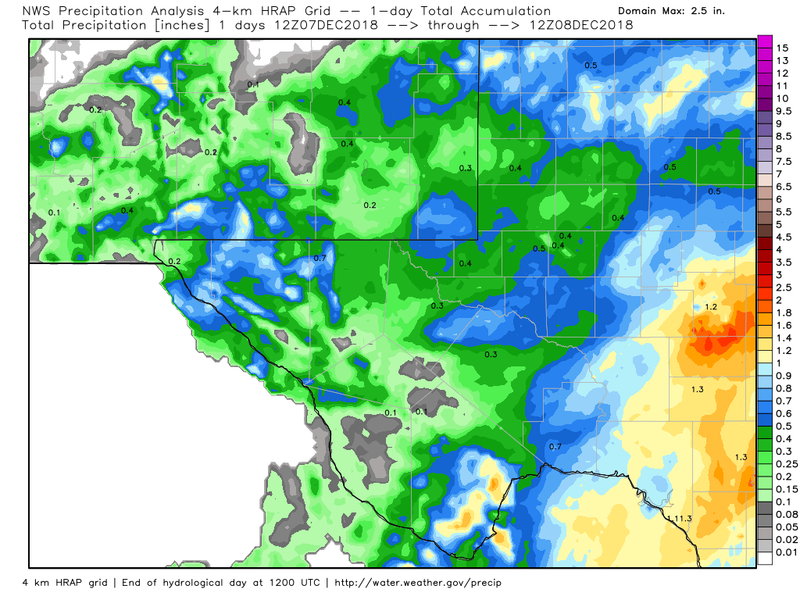 Another surprise was that the heavy rains that were forecast by the models did not develop, at least not in Southeastern New Mexico. Not so in West Texas. No thundersnow was reported to my knowledge either. Sierra Blanca Snotel - Near Ski Apache 2"
Atoka South Of Artesia 1/2"-1"
Here at our home in Carlsbad rain changed over to snow at 2 AM. Between 3 AM and 3:45 AM big wet snowflakes the size of quarters fell. My temp ranged from 35º to 33º and this combined with a warm ground melted the snow as it fell so it never accumulated. 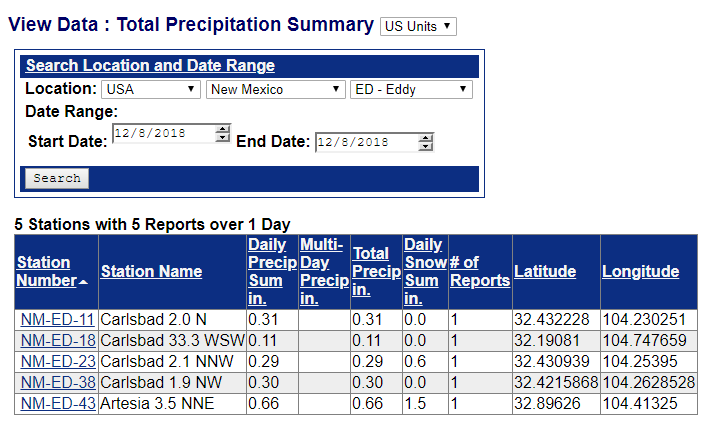 I recorded 0.6" of snowfall and .29" of rainfall which included the melted snowfall.